General: £10 general public. Members and students: £8 BHA, AHS and SPES members and students with valid ID. Free to members of the Centre for Inquiry UK. ***Special offer*** Tickets to this event and the Blasphemy! event on the 28th January £16 general, £12 members and students):Members and student ticket offer and General public ticket offer. Chris French is a Professor of Psychology and Head of the Anomalistic Psychology Research Unit at Goldsmiths, University of London. He is a Distinguished Supporter of the British Humanist Association and former editor of the Skeptic. Belief in spirits can be found in all human societies and a substantial proportion of the population claim to have had direct contact with a spiritual realm beyond ordinary experience. This talk presents an overview of scientific research into sleep paralysis, near-death/out-of-body experiences and reincarnation claims in support of the claim that such topics can be understood without recourse to paranormal explanations. A ghost hunter that doesn't hunt for ghosts, Hayley Stevens has been researching paranormal reports since 2005. She is the co-host of the Righteous Indignation Podcast, blogs at 'Hayley is a Ghost', occasionally writes for numerous publications, and has spoken internationally about ghosts and critical thinking. As someone who used to actively hunt for proof that ghosts existed, Hayley has first hand experience with the weird and scary lengths that ghost hunters will go to, to contact the dead and prove they exist in spirit form. 'Is there anybody there?' will give insight into the modern world of ghost hunting where a scientific approach is more likely to be an updated version of seance parlour antics - from the evolution of table tipping, to the revolution of the Ghost busting Smart phone apps. Paul has been a professional trickster for almost thirty years during that period has appeared countless times as performer, presenter and pundit on numerous TV shows across many genres. As someone who spent a brief period (in his admittedly misguided youth) as a fortune-teller and 'psychic', and as a lifelong student of cons, scams and swindles, he is well qualified to talk about the current crop of mediums and the media bias towards their promotion. He would like to take the precaution of prefacing his entire talk with the word 'allegedly'. A mild rant about TV mediums and the similarity to their predecessors of a century ago. Richard Wiseman is the Professor for the Public Understanding of Psychology at the University of Hertfordshire. He has been active in the skeptical movement for many a year, does Twitter stuff, has recently written 'Paranormality: Why we see what isn't there', and likes dogs. Do ghosts really exist? What actually happens at seances? How do you go about testing mediums? Why do these sorts of paragraphs often involve a long list of questions? All of this and more will be revealed in an exciting talk that will dig deep into the psychology of belief. Free packet of peanuts for the best question. Ian Rowland is a writer and entertainer with an interest in various aspects of how the mind works or sometimes doesn't. He taught FBI agents how to be persuasive, and taught Derren Brown how to read fortunes. In America, in front of 10 million TV viewers, he proved that he could talk to dead people - or at least fake it well enough to convince complete strangers. He knows an awful lot about cold reading (look it up), but tries not to drone on about it at parties. He is good at drinking tea and waiting for interesting invitations to come his way. Ian will perform a few miracles, just because he can and it's fun, while explaining the truth about psychic powers, miraculous gifts and the afterlife. He will also demonstrate that you are just a little bit more magical and miraculous than you may realise. 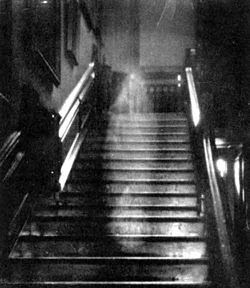 I have never had an experience even remotely like what one would call seeing a ghost, even though a few times a week I take a short cut on my bicycle through the length of the large local cemetery on my way home at night--often very late at night. Because I have done this for years and at times have even wished to see a ghost but never have, I have absolutely no fear of the dead. Rather I fear those living who hold nefarious designs. But I would not conclude from this that it is not possible that there are ghosts, or some kind of afterlife or some such. I am willing to entertain the possibility that my reasoning and experience are not conclusive. If there are such things then they are, in my view, part of the actual normal fabric of things---what else could they be? No doubt you define things such that your "normal" excludes the possibility that such things exist. But your presumptions are just that and needn't be subscribed to. Where is the necessity? Ultimately, your position is based upon the notion that you cannot be wrong in your presumptions and reasoning. I'd love to see an argument for that that is not obviously circular. It's a shame there's not a little diversity of views here just to shake things up a little and stop it being a preaching to the converted (nod, ummm, amen bro, preach it!). If we're worried about raising heads above a material parapet (spelling?) I know there's at least one scientist on the Closer To Truth website who thinks ghosts are externally existing realities. Whether he thinks they are properly mind-independent or not I can't recall.